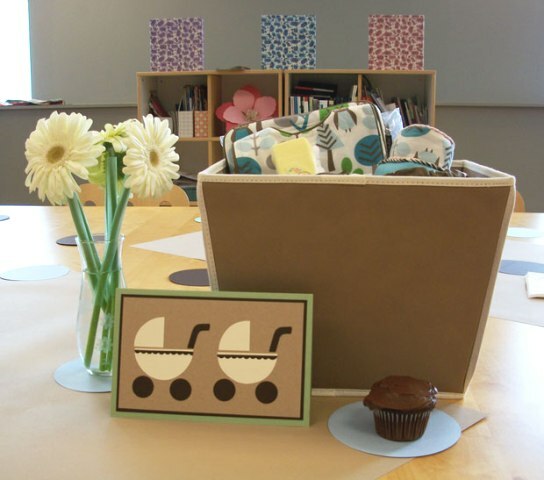 We recently threw a baby shower for our coworker, Lauren, who is having twins next month (or perhaps sooner!). With a “twice as nice” twins theme and a color palette inspired by her nursery, we put together simple decorations and a fun card with a baby shower gift that made for a delightful afternoon. We always do our best to create a one-of-a-kind card for every celebration. For Lauren, I made a baby buggy card using circles as the design element. 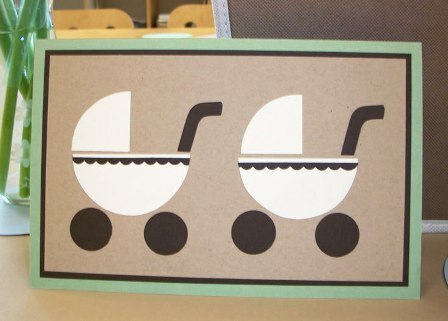 I featured two buggies for the twins, but the baby buggy concept would work well with just one buggy or used on a baby shower invitation. 1. I used a leaf A9 card as a base, layering chocolate and khaki paper in slightly smaller rectangles to create a little matted frame. 2. The base and canopy of the buggies are made from superfine soft white 2 1/2″ round labels, which I cut using a simple guide (to make the guide I peeled one label off the sheet and folded it in half). Using this half circle guide, I cut another circle label in half and adhered each half to the card as the base of the buggies. 3. Next I folded the guide in half again so it was a 1/4 of a circle, and used that as a guide to cut nice 1/4 circles for the buggy canopies. 4. The buggy wheels are made from 1″ circles punched from chocolate paper, and then I hand cut little handles for each buggy. 5. For a decorative finish, I trimmed the edge of a chocolate A2 scallop card and added it to the buggy base. A simple theme with thoughtful touches made the day, but most importantly we took the time to celebrate this very special occasion. Best of luck, Lauren! What a beautiful, yet simple invitation. Congratulations! Lauren from a fellow my of twins.